Carla Teresa Trent age 54 was born January 26, 1963 in Columbus, Ohio to Landon William Trent Sr., and Josephine Trent. She departed this earthly life on January 21, 2018. Carla was baptized in Jesus name at Apostic Christian Church of Christ and received the Holy ghost at age 13. She loved going to the rest home with the missionary and visiting the hospital with the teens. She was very active in church until she was overcome with sickness. Her favorite song was “going up yonder”. Carla loved reading and playing her DVD player. She loved her Pepsi and eating. Carla went to Mifflin Middle School, Champion Middle and East High School. Carla is preceded in death by her father, Landon W. Trent Sr.; brother, Landon W. Trent Jr.; grandparents, Ben and Bessie Bean, George and Velma Trent; aunts, Evelyn and Lewis Ardister, Susie and Adam Pritchard, Annie and Donald, Lindsay Barbara, Emmanuel Hurd, Lottie West, Kattie Bean, Besty Bean, Martha Howard, Ella Trent; uncles, Robert Bean, Jack Bean, David Bean, Ben Bean, Earl Trent. Carla leaves to cherish her memory with mother, Josephine Trent; and a host of other relatives and friends. Internment at Evergreen Burial Park. To the Trent family, I am so sorry for your loss. Our Heavenly Father promises that in the near future, there will be no more sickness (Isaiah 33:24). He knows that death is one of the most difficult situations we must face. That is why He tells us at Isaiah 25:8 “He will swallow up death forever, And the Sovereign Lord Jehovah will wipe away the tears from all faces.” May you find comfort in God’s word at this difficult time. 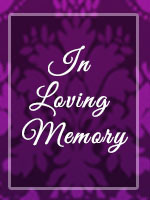 To the Trent Family: You have my deepest sympathy! God’s Kingdom will get rid of our enemy death! God’s promise brings a real hope of being reunited with our dear love ones. (John 5:28, 29). Carla is now alive and well celebrating in her new home of Heaven, but she surely will not be forgotten in the hearts of all who knew her. In the days ahead, may Jesus our God of comfort hold ou all in the palm of His hand as you remember and celebrate her life legacy. ‘Precious Lord, take my hand…lead me home’. I am so sorry for your loss. Your faith in our heavenly father will see you through this. May God bless and keep you. I am here for you. Hi Josephine… Just heard today that your daughter passed away…. Will keep you in my prayers ..